1 of 4 Cut parchment to fit in the bottom of two 8-inch round baking pans. Coat with nonstick cooking spray. Prepare cake mix according to package directions for two 8-inch cakes, substituting buttermilk for water and using vegetable oil and eggs. Pour into pans and bake at 350 degrees for 34 to 38 minutes, until a toothpick inserted in the center comes out clean. Cool in pans on baking racks 15 minutes. Remove from pans, remove parchment and cool completely. 2 of 4 Meanwhile, prepare frosting. Using a stand mixer or hand mixer, combine butter, confectioners' sugar and milk. Beat on low until just combined, then on high 3 to 5 minutes, until fluffy. Set aside 1 tbsp of the frosting. 3 of 4 Carefully take apart mini and regular Oreo cookies, making sure frosting sticks completely to one of the halves. Place non-frosted halves in a resealable plastic bag and smash into pieces. 4 of 4 Trim layers to make each flat. Place one cake layer on a stand. Spread 3/4 cup of the frosting evenly over top and sprinkle with smashed cookies, pressing slightly into frosting. Place second cake layer on top, then spread remaining frosting over top and sides of cake. With a bit of the reserved frosting, secure one of the M&M's to each of the 20 Oreo halves. 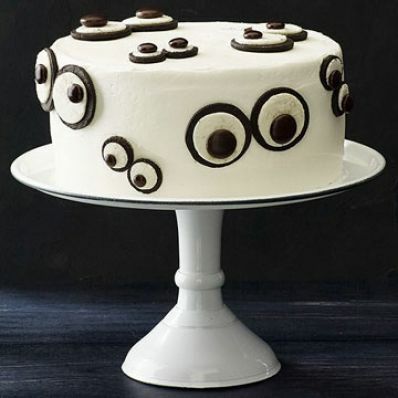 Arrange on cake so they look like pairs of eyeballs.